Teenager Stella gets the results of her blood tests in a hospital on Mont Saint-Michel, the famous landmark on the Normandy coast. A picturesque though unlikely and impractical choice; you can only get to it at low tide for a start. Perhaps the place has been a well-known centre of healing since its origins as a leper colony in the Dark Ages or something and I’m just showing my ignorance. In a mix-up, perhaps or perhaps not deliberately contrived by the mischievous young Belgian (at least that’s where she says she’s from), the doctor gives the unvarnished truth of the results to middle-aged Englishman Richard, in the mistaken belief that he is her father. And he doesn’t even look Belgian; he’s an unshaven figure in a heavy overcoat with the posture of a hungover consumptive, though the disappointing truth is that he’s merely there to get a cut hand seen to. There seemed to be a lot of these love stories around in the ‘seventies, about middle-aged men being the objects of over-attention from pretty young girls. Transparent wish-fulfillment fantasies, perhaps they were the revenge of the generation that missed out on the decade of free love. Often they had a mawkish tint. 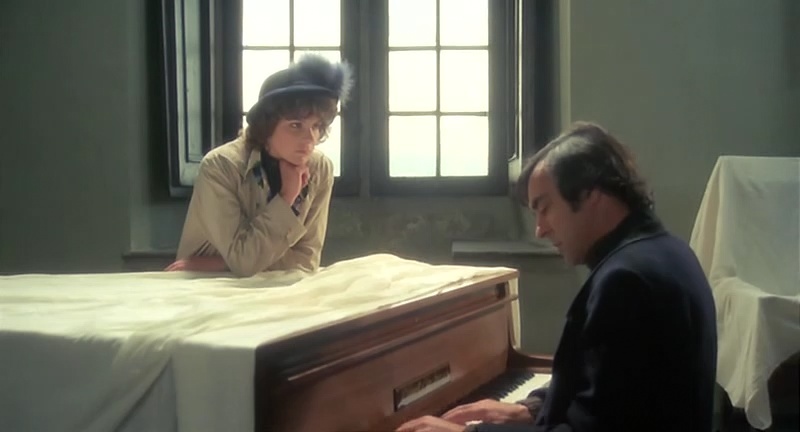 Some were more gloomy than others; Moments (1974) for instance, with Keith Michell and Angharad Rees, positively wallowed in an atmosphere of abandoned hopes, emptiness, and death. This one is about in the middle. The photography, most notably of the wintry coasts of northern France, is attractive if unimaginative. But in an era when even the most humble Italian films could have fantastic soundtracks, this one by the normally gifted Stelvio Cipriani has a plonking theme orchestrated for what sounds like recorder and tambourine. The Last Concert (to use the title chosen for the English-language edition reviewed here) frequently provokes unintended hilarity. Richard Johnson, something of an older Alan Bates-alike (cf. Story of a Love Story (1973)), is decently gruff and hangdog but in a role that is inherently ridiculous. Pamela Villoresi is clearly from the school of acting that says the best way to play the part of a sixteen-year-old is by simulating brain damage. (On second thoughts perhaps she was just trying too hard to pass herself off as a Belgian.) Her eccentric tones of speech (scratch that: gabbling) are not what I would confidently identify as an Italian imitating a Belgian girl’s English accent, but she’ll do. Best line: “I am a silly girl; I won’t talk any more.”. Well, most promising line anyway. It’s surprising to note how few characters are in this film. I mean people who interact with the leads and develop the storyline, rather than doing something as humdrum and mechanical as delivering a piano. The only character of note is Richard’s plump and jolly landlady, a mellower version of the Claire Davenport type. Strangely enough she can’t wait to bundle the young couple into bed; not like an English seaside landlady at all. Her daughter appears once at the breakfast table, played by Lucia D’Elia whose only other role was in Beyond the Darkness (1979). This cameo is just as memorable. Watch half her career going by in one hearty appetite. Such a lovely girl. I wonder what happened to her? Stella’s antics, refusing to take anything seriously, taunting and manipulating with childish tricks, begin to suggest there is method behind the imbecility, and this flibbertigibbet has hidden depths – and pain. She reveals that, now her mother is dead, she is on a quest to find her father, a wealthy man who abandoned her as a baby. Meanwhile, after one joke in poor taste too many Richard finally cracks and slaps her; though it’s closer to the truth to say he fells her with a right hook. He put the entire weight of his body behind the blow, not to mention forty years of rage. The impact would certainly have broken the girl’s jaw. But they are friends again almost at once. The pair visit a vacant house belonging to Stella’s father, a grey coastal mansion in strawberry gothic. As she wanders through the empty rooms haunting music drifts through the house. Broken-down bar-room piano bum Richard has pulled back the dust sheets from a grand piano and is playing a slow movement from a classical concerto of his own composition. It’s a revelation as profound and deeply moving as Tom Fun’s down-and-out friend Derek turning out to be the drummer from Roxy Music. So will it be kiss-and-make-up, or goodbye forever? We’re only half way through the running time so we can guess the answer to that one. It’s all utterly ridiculous, but on a second viewing the story reveals more subtleties than the crude treatment allows a sane person to take in at first sight. The stuff that cults are made of.